Note to any artist who is wishing to paint more in plein air. Painting outside is awkward, and hard, and invaluable to what it adds to your ability to see and paint inside and out. My advice: practice. Practice setting up your easel, or paint box, practice inside when no one is watching and work out the kinks of your equipment. I will paint you a scenario from last spring…. 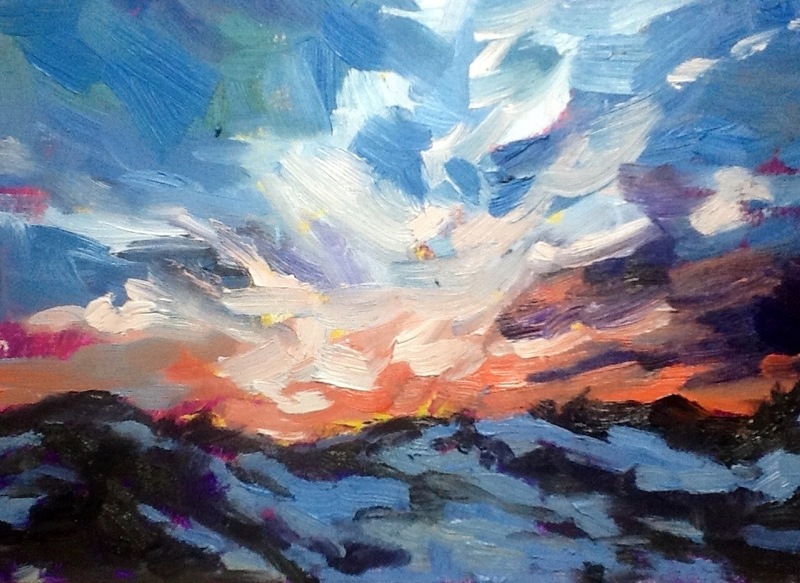 I set up to paint the sunset on the beach, in oil, with a new travel easel. I spend the summer painting sunrise and sunsets plein air, in the DESERT, in PASTELS. Imagine my arrogance at thinking I could handle this new medium, subject, and hardware with ease. Well, as beach sunsets at popular vacation destinations tend to do…a crowd gathered, and my easel offered more of an attraction. So I was setting up a new easel, in the sand, and the wind, with a crowd curiously looking on. I had NEVER set up this easel, it was almost like the old one. ALMOST, did I bring the instructions? Nope. Was I wishing I would have practiced at home? Hmmm, maybe this screw goes this way? Or perhaps I have to turn this bracket around? I was dropping bolts in the sand and cursing myself. I finally sat down in the sand embarrassed. I forced my way through the painting, but it was awkward. I wasn’t familiar with the colors I would need. Finally I rode my bike to a coffee shop the next day to use wifi, and found a video of how to set up the easel. NOTE: parts have been reversed for shipping the first time you set up this easel you will have to completely disassemble and reassemble. I learned my lesson. I decided to take a bit of my own advice today. Paint a sunset (from a photo), no wind, no crowd, no pressure. I set my timer and set to work, I learned there are colors I wished I would have had and wished I would have pre toned the canvas. Good lessons for the next beach painting session. Great post. As is often the case, about much more than painting! Good points. I still have difficulty putting my easel into position. You have given me encouragement to keep trying. Like so many others – just fabulous. what a great life-lesson in humility 🙂 thanks for sharing, not just for artists, but for all of us to remember. Practice makes perfect and you’ve about got it. Paint on, girl, you’ve got talent!